Obtaining new apps, books, and movie rentals for your Droid Bionic can be done anywhere that you and your phone just happen to be. You don’t even need to know what you want; like many a mindless ambling shopper, you can browse until the touchscreen is smudged and blurry with your fingerprints. You obtain items from the Market by downloading them into your phone. That file transfer works best at top speeds. It’s best to connect to a Wi-Fi network if you plan to obtain apps, books, or movies at the Android Market. Wi-Fi not only gives you speed but also helps you avoid data surcharges. 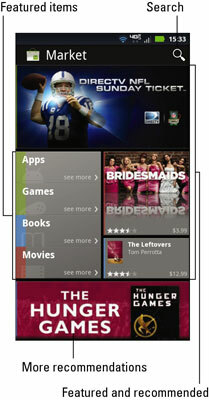 New apps, books, and movies await delivery into your phone, like animated vegetables shouting, “Pick me! Pick me!” To get to them, open the Market icon, which can be found on the center Home screen panel or accessed from the App Menu. After opening the Market app, you see the main screen, similar to the one shown in this figure. You can browse for apps, games, books, and movie rentals. The categories are listed on the upper-left part of the screen, with the other parts of the screen highlighting popular or recommended items. Those recommendations are color-coded to let you know what they are: green for apps, blue for books, and red for video rentals. Find items by choosing a category from the main menu (refer to the figure). The next screen lists popular and featured items, plus categories you can browse by swiping the screen right to left. The category titles appear toward the top of the screen. When you have an idea of what you want, such as an app’s name or even what it does, searching works fastest: Touch the Search button at the top of the Market screen (refer to the figure). Type all or part of the app’s name, book or movie title, or perhaps a description. Touch the keyboard’s Search or Go button to begin your search. To see more information about an item, touch it. Touching something doesn’t buy it, but instead displays a more detailed description, screen shots, a video preview, comments, plus links to similar items. The first time you enter the Android Market, you have to accept the terms of service; touch the Accept button. Books and videos you get from the Market are viewed from the Books and Videos apps, respectively.